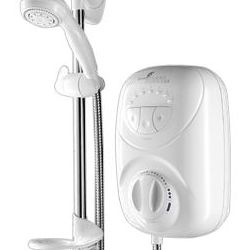 The Galaxy G2000LX Thermostatic Power Shower differs greatly electric showers and as such can have different problems and issues when things go wrong. The Galaxy G2000LX is more like a mixer shower taking in hot and cold water and mixing them to the desired temperature. Unlike a mixer shower it has a built-in pump to provide a more invigorating shower experience. First check that the valves to the shower are fully open as there may not be enough water getting to the shower. The check that the filters, hose and head are not blocked. You may have a faulty solenoid valve. If you have access to a multimeter you can test it. Check the valve while in the failed state; you should have a reading of at least 3.5 KOhms across the two terminals. Any less then you need a new valve. This video is intended as a general guide and does not cover every shower. A faulty PCB may also cause this fault. Unfortunately there is no way to test it. In general we recommend replacing the solenoid valve before trying the PCB.